We’ve written at length recently about how public relations can boost content marketing and how public relations can be an integral part of your content marketing strategy. There is a dark side, a reverse side to this topic: content marketing could also kill the effectiveness of your public relations efforts. How? Public relations professionals are more frequently being asked to pitch “non-traditional” content. Gone are the days when we could simply send out a press release or three, make a few phone calls to connect an executive to a reporter, and watch the hits roll in. Today, PRs are being asked to pitch infographics, to get blog posts and bylines placed, to make videos “go viral”, to promote online events from chats to live video hangouts – in short, to market brands’ content marketing. The nature of content marketing is that content must keep getting better simply to stay relevant to the same audience. 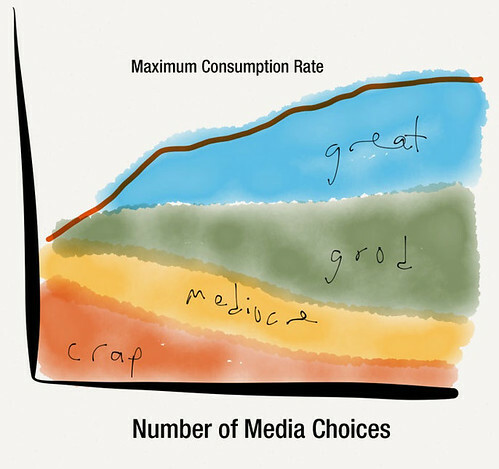 Equally true, because of the nature of content marketing and its perceived ease (and perceived low cost), companies will keep producing content that is increasingly mediocre, and in vastly greater quantities. What could kill public relations is not the content marketing itself, but increasing pressure from brands to pitch mediocre or bad content. Reporters, influencers, bloggers, and media channels are already swamped with a rising tide of bad content. Adding in aggressive pitching from PR professionals and this will only make the situation worse, while accelerating the degradation of the relationships between brands and their media sources. Imagine for a moment a media influencer’s inbox. The deciding factor between whether they even bother to open four dozen emails titled “Latest infographic from X about Y” may be who sent the email. A trusted PR source may be the only reason that an email gets opened. Because of the increasingly valuable nature of the relationship between PR professionals and media resources, we will do better to educate a client or business stakeholder by declining to pitch a piece of mediocre content than to aggressively pitch something that will seriously damage or destroy the relationship with the media influencer, preventing us from getting anything placed for said client in the future. In order to preserve those relationships, we must get in the business of recognizing good and bad content and help brands improve their content long before it is pitched. This means that we, as PR professionals, must become proficient at recognizing bad data, bad analysis of data, lack of creativity, rewrites and plagiarism, and a myriad of other symptoms that define bad content marketing. We will also need to be well-read in virtually every aspect of their brands’ or clients’ industries to keep current and be able to counsel clients about their content marketing. This also means that PR will need to work in concert with marketing efforts, so that scarce resources are not wasted producing bad content that will get no traction or attention. If we do not proactively stop bad content from being pitched, then the rising tide of mediocre content will permanently ruin the profession of public relations. No reporter, no journalist, no influencer wants to publish garbage, and the clamor to do so by inept content marketers will only get louder. Resist the temptation to pitch something you don’t love! How essential is Google+ for PR and marketing?